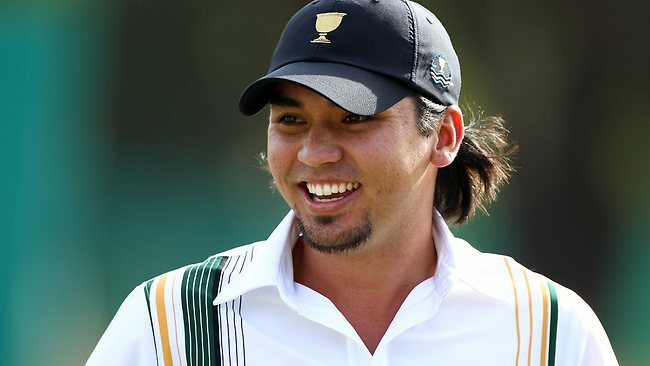 For a man born in Bagdad, winning arguably golf’s most glamorous and high profile major tournament ain’t half bad as achievements go. This is Bagdad, Florida of course rather than a certain location which the American nation is a little less fond of but still, for a man of such humble beginnings and of such immense personality this was one hell of a win. 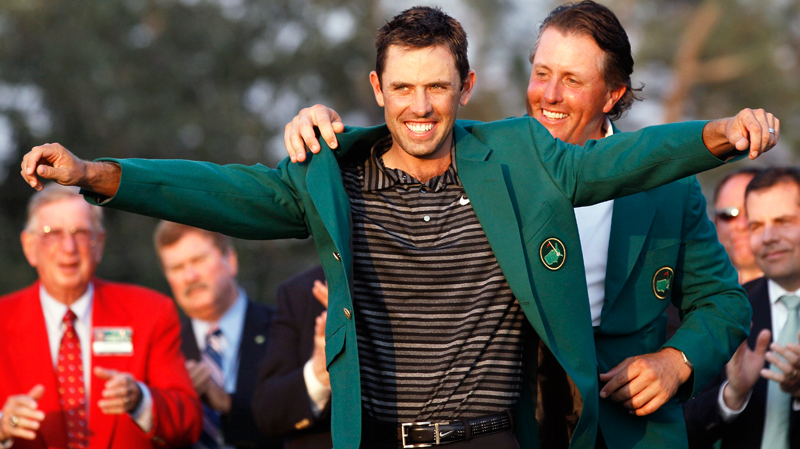 Not only has he bagged a Green Jacket, which by the way I think would go awfully well with a pair of dungarees (see attached video evidence) but the fashion in which he did so was enormously admirable. The manner in which he plays the game is, generally speaking and quite frankly, extraordinary. His temperament as we saw very clearly when he had a “mudball” on the first fairway is raw and unkempt at the best of times, his swing is in almost no way at all ‘technically sound’ and his game is renowned far more greatly for it’s staggering length rather than it’s deadly accuracy. 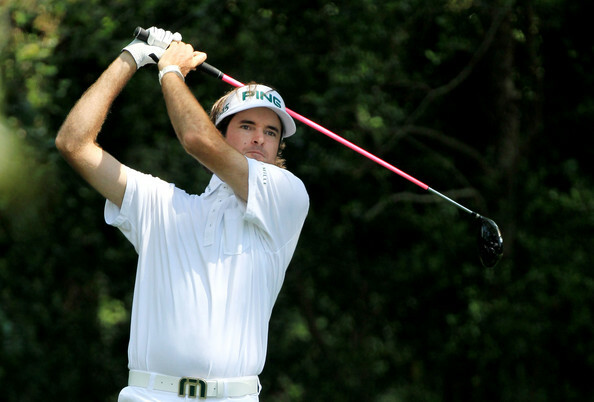 In nearly every way imaginable Bubba is an outstanding golfer and, perhaps a little unfairly, I mean that in terms of his character and his persona on and off the course rather than his game. Somehow though he has managed “without a lesson” to become one of the finest golfers on the planet and one of the finest players of his generation within a nation which is arguably historically the strongest golfing nation on the planet. 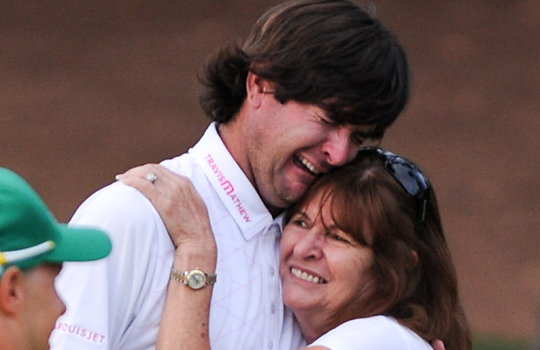 Few lucky people can call themselves a major golf tournament winner and now Bubba has defied the odds and certainly some golfing logic to become one of this privileged bunch and as much as my previous tone might suggest that he is a little bit of a shock winner I don’t actually find his victory that much of a surprise. In fact, I did have enough faith in his abilities to place the princely sum of £2 on him to win the tournament after he had got himself in position after day one and it made me several quid richer. Thanks Bubba. 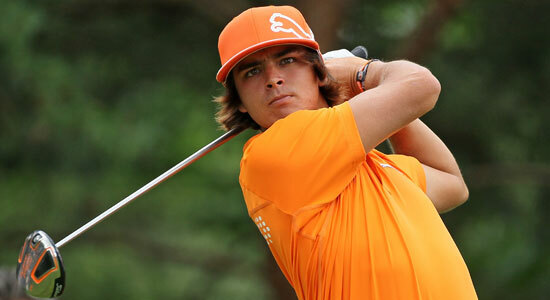 Though he may be unorthodox, and he may be pretty hot-headed and at times he may even be a little rash, it is these characteristics which have made him a major winner and that mean he could be a constant threat in the big four tournaments of golf’s calendar year for the foreseeable future. Such character traits may not be befitting of a man who would reach the top of the world rankings (ie. 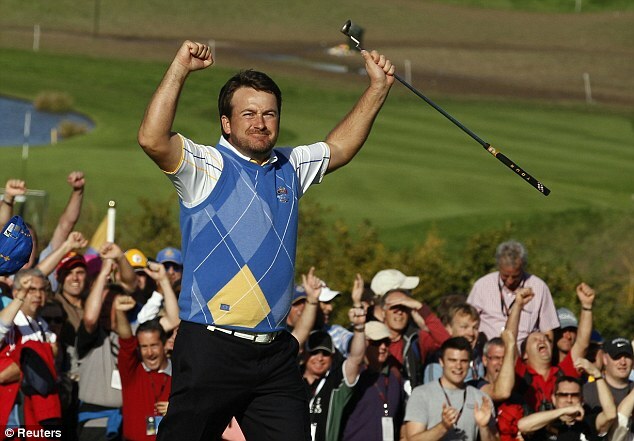 a Luke Donald-esque player), or that of a man that always delivers when in position to charge to victory but they are the hallmarks of several players that have become icons of the game, most notably, Seve Ballesteros. The likes of Seve have of course become the best player in the world and have topped the rankings and that is perhaps because they aren’t in the same league as someone like Bubba, they are in no uncertain terms the cream of the unpredictable crop. Watson is indeed almost certainly more streaky and more unreliable than some of the game’s huge, exciting and at times over-the-top characters but it is his temperament and his playing quirks which give him the X-Factor which certain players lack. On this, the day of his most significant golfing triumph to date, Bubba did keep a fairly cool head though and he did play pretty straight and pretty sensibly. There were no eagles, no long range hole-outs, but his relentless, punishing length of the tee was crucial as was the imagination and sheer outrageousness of his ‘tournament winning’ hook out of the woods with the wedge in the play-off. 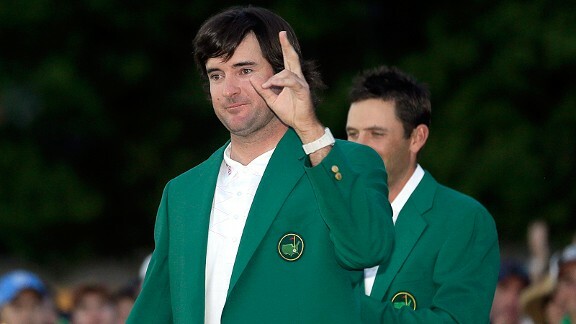 Whether Bubba ever wins another major or ever has such a satisfying day in his career again is unclear but I think one and all can accept that he was a deserving winner and that he is now a Green Jacket holder because he showed extraordinary bottle, class, skill and character throughout the overwhelming majority of the four days at Augusta. 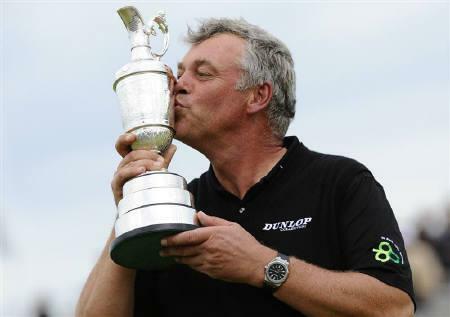 Darren Clarke the forty one year-old from Northern Ireland has today won his first major. It was the most glorious of champagne moments in golf and fittingly Clarke suggested that he will be “very, very hungover” come tomorrow morning, and quite right too. It was a display of class, maturity and real links skill from start to finish and ultimately Clarke more than deserved his victory, which, as it turned out came surprisingly easily by the time he reached the home stretch. Whilst he plodded on merrily churning out par saving putts and knocking in the occasional birdie and eagle the other immediate challengers fell away and some more dramatically than others. From start to finish the likes of Jimenez, Glover, Kaymer, McIlroy and Fowler steadily slipped further and further behind the dominant Northern Irishman. The majority of the afore mentioned had pieced together three consecutively impressive rounds, but today they all missed the mark. Conditions were in truth probably easier going than the apocalyptic coastal climate experienced in Sandwich yesterday but this didn’t seem to help the pre-round contenders. Sadly only three men really threatened to seriously endanger Darren’s charge to Open Sunday glory. 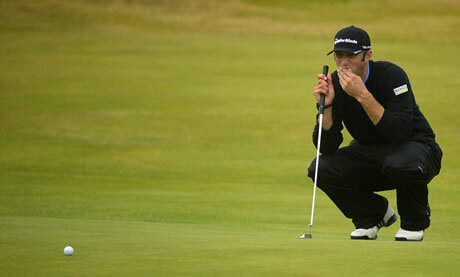 The first of these was Thomas Bjorn who until the last couple of holes maintained a score of around three-under par. Though he never made a forward charge as such he managed to just hang in there and prove a potential irritation, just about staying within striking range if anything were to go badly wrong for Clarke coming home. 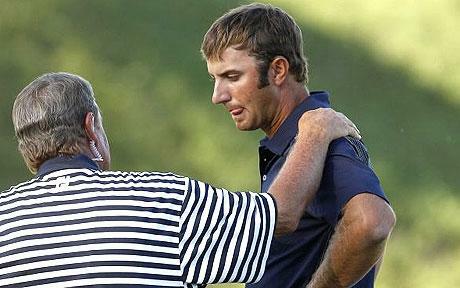 The second maintained challenge came from Clarke’s final group partner Dustin Johnson. 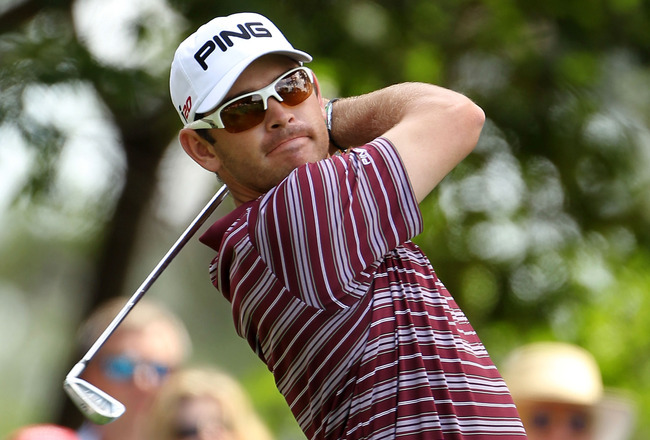 For a long time Dustin was biding his time, not shifting his score too dramatically in either direction until just after the turn where he conjured up two birdies in three holes. These flashes of genius were then backed up by a fantastic drive and approach to 13 where he looked odds-on to steal another and move to six-under. At this very moment Clarke had over-cooked his approach to the same green and had a daunting up-and-down left for his par. 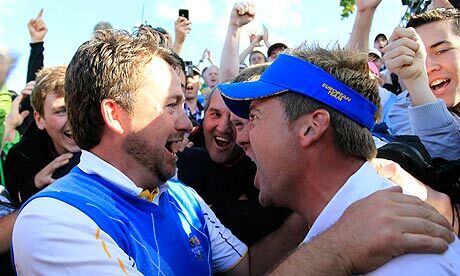 This for many was the moment Clarke secured a grip on the Claret Jug, Clarke made his up-and-down and Johnson’s putt lagged short of the hole. 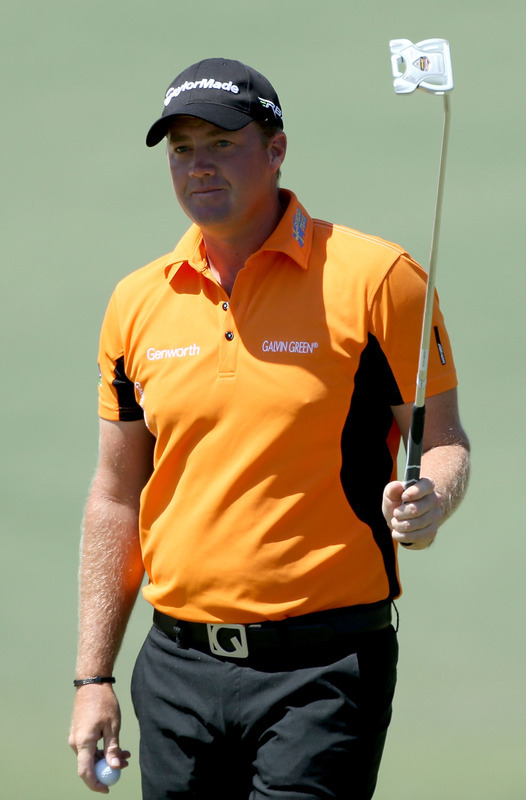 From looking like they were about to have parity restored, Clarke walked to the 14th with a two shot lead still in tact. Perhaps with this missed opportunity in mind Johnson smashed his second shot on the par five 14th way out of bounds and took his challenge out of the reckoning. 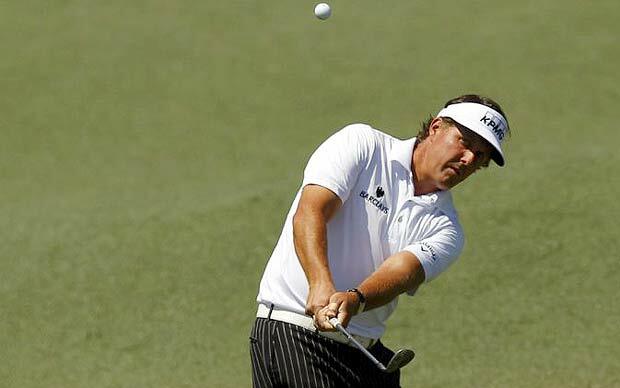 The final challenge for Clarke, and perhaps the most threatening was that of Phil Mickelson. 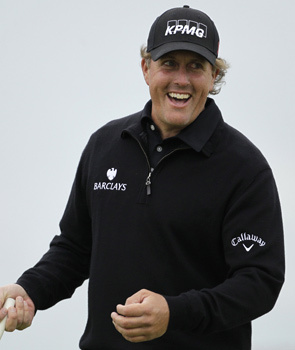 ‘Lefty’ produced a simply stunning front 9 consisting of just thirty blows. The only complaint he could possibly have had was that a couple of putts lipped out, otherwise he could have even produced something like a twenty eight. 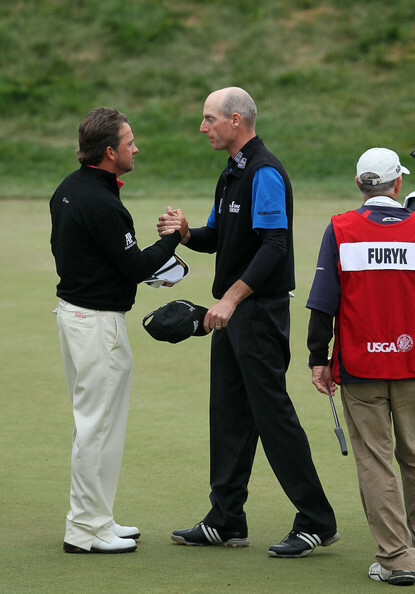 This special nine holes of golf saw Phil level up with Clarke on five-under par. 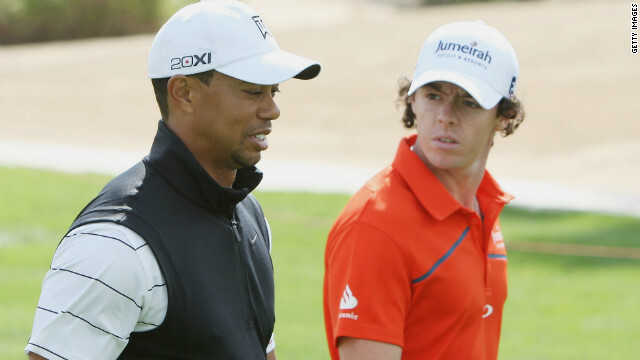 He had him in his sights and seemed ready to blow him away down the back nine also. But this was not to be. Having lipped out another birdie putt at 10, Mickelson then missed an absolute sitter to save his par at the par three 11th. This lapse in concentration came at roughly the same time as Clarke’s majestic eagle at 7, and with it the seriousness of his challenge begun to die away. These major challengers came and went and with a couple of strokes of luck Clarke saw things through. 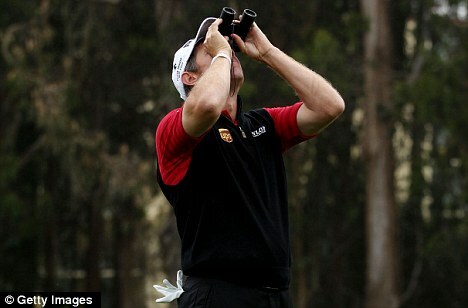 Even amidst the pressure of seeing the likes of Mickelson shooting up the leader board he remained breezy. For the majority of the final day his face was adorned with the widest of Irish grins, in the great moments he remained positive and when the bogey’s came he took them with a pinch of salt. He was calmness personified throughout. 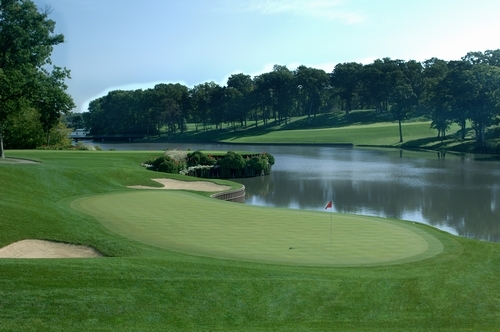 A great day for golf and golfers alike. Clarke has always been an immensely likeable character and is known to be one of the more popular players on tour. Finally twenty years of plying his trade in the upper echelons of the golfing world and several years of personal unrest must seem worth it. He has until recently endured an immense test of character following the untimely and tragic death of his wife Heather and to see him happy again is a treat. This was a victory which very few could begrudge. The third day at a major tends to be all about surges through the field. Today only a handful of players managed this whilst the rest of the field dropped steadily back. It is entirely possible that we are set for one of the rare occasions where the leading score after round one is lower than the overall winning score. 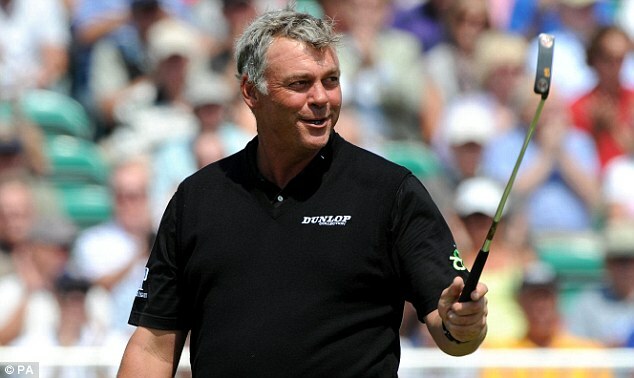 Going into the final round Darren Clarke is the outright leader on five-under par, the very same score posted by Thomas Bjorn and Tom Lewis on day one. With today’s foul weather forecast set for something of a repeat performance tomorrow, scoring patterns are again likely to be sliding even further backwards. 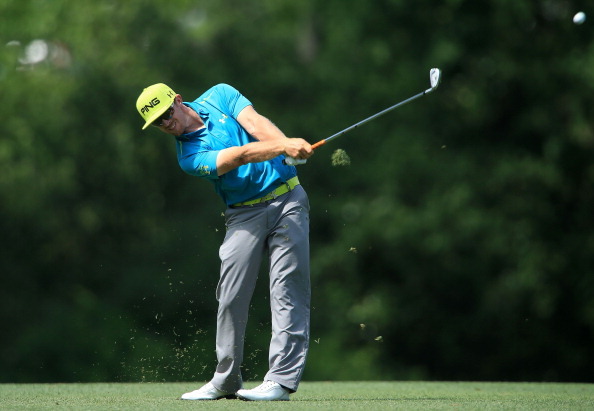 Bucking today’s scoring trends were the likes of Americans Dustin Johnson and Rickie Fowler. 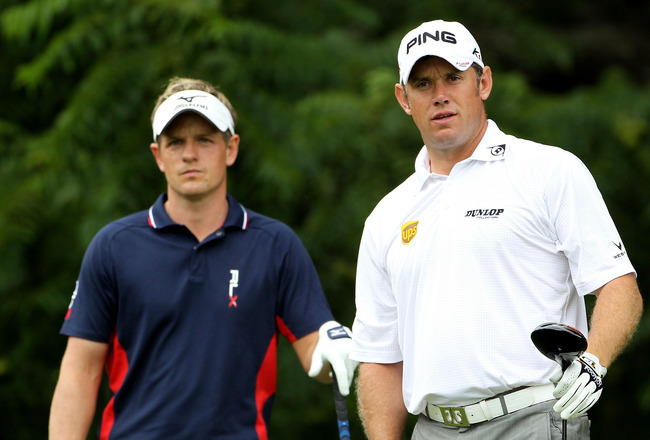 The pair of them carded odds-defying rounds of 68 pushing them up the leader board and right into contention. As a result of these rounds Johnson will go into day four playing alongside Clarke in the final group and just one off of the lead and Fowler has moved from level par to two-under. Tomorrow provides the chance for these two young pretenders to really put a stamp on world golf and what better way to do so than by bagging a major title. 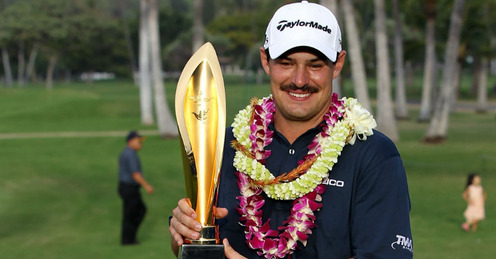 Johnson has already won four PGA Tour titles, an impressive feat for one so young, but will forever regret the golden opportunities which have passed him by in major golf already. 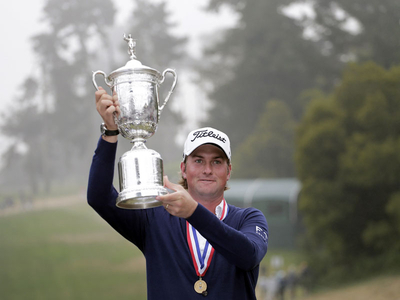 Two years ago he went into the final round of the US Open at Pebble Beach in links-style conditions only to collapse to a round in the eighties and fail to even come close in the final reckoning. 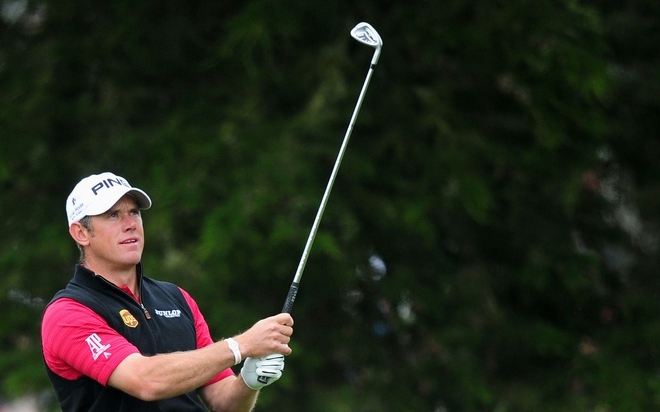 He followed this up at last year’s PGA Championship by going down the final hole as leader only to lose it on a club-grounding technicality. The latter of these sour major experiences for Johnson must have been excruciating. He was notified en-route to the green that he was being investigated on grounds of having floored his club before firing in his approach shot. 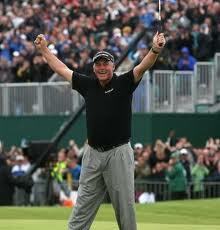 He then had his worst fears confirmed by tournament officials in the scoring hut after completing the round. His angst at this slightest little error in judgement and seeming pettiness of golf ruling was clear for all to see as the cameras gaze was placed firmly upon him when signing off his card. Few could admit to not feeling for him in this most agonising situation. 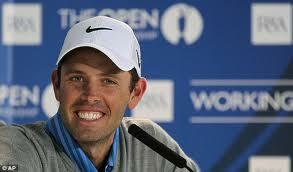 In contrast Fowler’s regrets in his budding career aren’t quite as significant. However, he is yet to have won a single professional title and people won’t stop reminding him of this until he does. 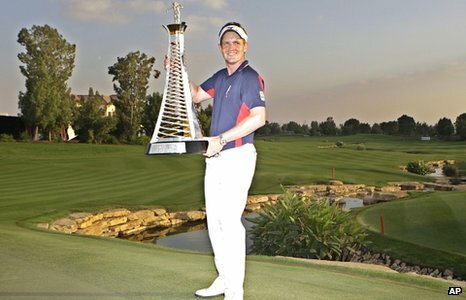 He has been in contention on several occasions o the PGA already but he really does need to land a title in order to put off his doubters. Making his first tournament victory a major would surely see him heralded as the US’ most threatening young prospect and endear himself to portions of the public who are yet to have taken to him. 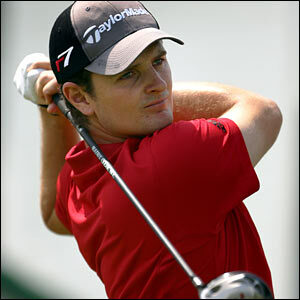 Both of these young Americans have demonstrated great maturity and a real flair for links golf. Dustin Johnson’s foundation is his monstrous driving, which has unsurprisingly been on fire here so far this week. 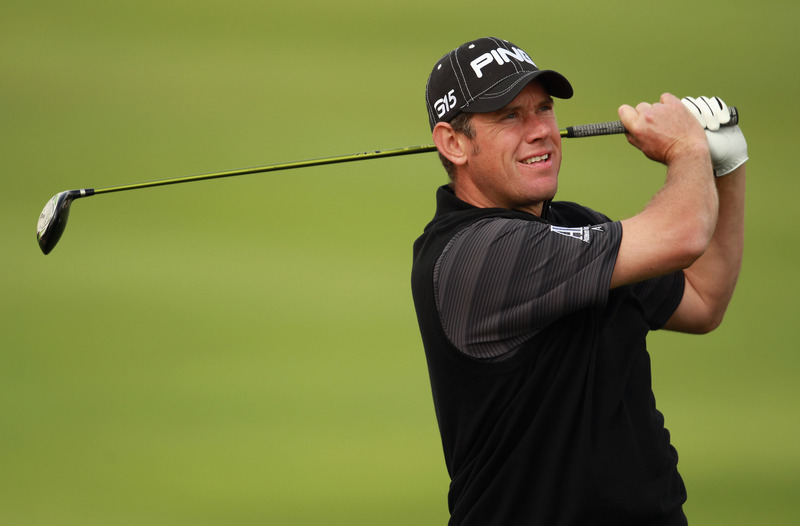 He has slowly climbed his way up the leader board and has holed several pressure puts at key moments as well as landing a magnificent hole-in-one on day one. Some might argue that Johnson has benefited from playing at times when the weather has been fairer, the same can certainly not be said of Fowler. 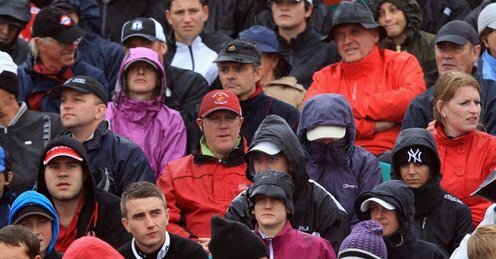 He has in fact probably had the worst of the weather throughout as was demonstrated by playing partner Rory McIlroy’s inability to keep pace with the form man throughout the three rounds which they have played together. Where McIlroy has missed his chances to stay in touch, Rickie has taken them and he fully deserves to be considered one of the favourites going into tomorrow. 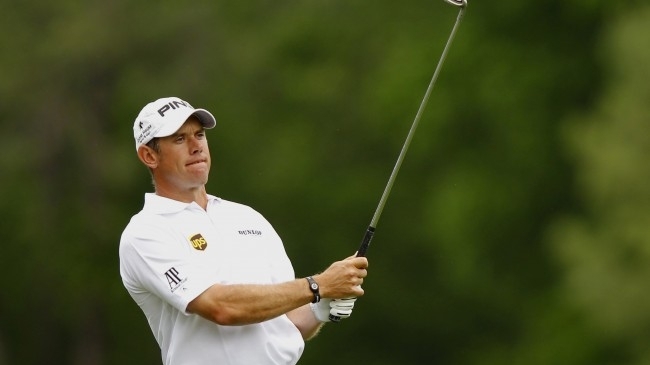 As well as the youthful stars of the US there are also major European hopes heading into day four and they all seem to be names you perhaps wouldn’t have anticipated going in. 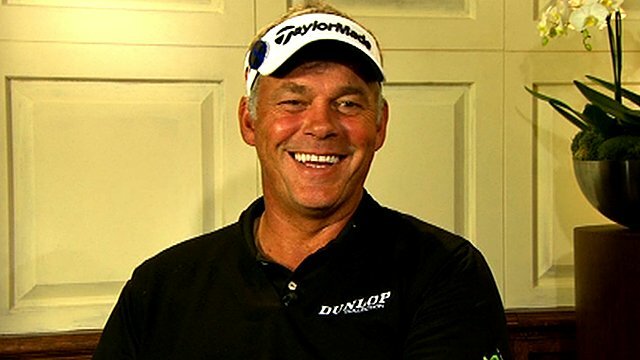 First round leader Bjorn is still there or there abouts, Miguel Angel Jimenez is only three shots back in his bid to become the eldest Open champion of all time, and Darren Clarke has maintained his lead and is set to follow the rest of these boys out tomorrow. Is it possible that the old-guard of the European Tour can fend off a last day challenge from the PGA’s finest young prospects? An intriguing battle lies in wait.